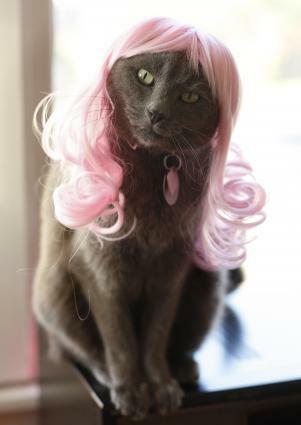 If you need something to cheer you up, it's hard to beat the image of cats in wigs. Author Julie Jackson talks about the idea that inspired her wonderful book. LoveToKnow chats with Julie Jackson, creator of Kitty Wigs. Julie first tried out her wig idea on her Siamese cat, Boone, and then teamed up with photographer Jill Johnson to create a hilarious book called Glamourpuss: The Enchanting World of Kitty Wigs. LoveToKnow (LTK): Thanks for agreeing to talk to us about your fascinating kitty wigs, Julie. Be honest, were you one of those kids that dressed up her animals? Julie Jackson (JJ): Absolutely! I used to go fishing with my dad when I was about four years old, and I insisted on wrapping up the tiny throw-back fish in wet paper-towel hospital beds before we threw them back in. Also, I used to promise the dog I'd bring her something back when we went out for dinner. If I forgot, I became completely inconsolable. I love animals a little bit too much. LTK: You came up with the idea for kitty wigs with your partner in crime, your Siamese cat Boone. How did he help you with the brainstorming for this idea? JJ: I was working at home as a freelance copywriter, and Boone was a permanent fixture on my desk. There were so many times a day when I would look up and catch him staring at me with those big blue eyes. I think he was probably trying to get the idea into my head by osmosis. LTK: When did you decide to go from putting wigs on your cat to offering wigs for other cat owners? JJ: I made the decision as soon as I found a willing photographer. I had the idea and was researching wig sources long before I launched the website. Although I enjoyed taking photos -- and that is really the core idea behind Kitty Wigs -- I didn't think my photos were good enough to get the idea across. Dallas photographer Allison V. Smith generously volunteered her services and invited three photographer friends to join her. Only one of those (Jill Johnson) responded, and it was Jill that later became the photographer for the Kitty Wigs book, Glamourpuss. She's a hoot. LTK: Tell me a little more about your wigs... What are some of the different varieties available? Occasionally I'll have other colors available, but since the wigs aren't easy to get make, I mostly stick to the four basic colors. For the book, we had dozens of different styles. I wish I could carry them all. LTK: How well do cats tolerate wearing the wigs? JJ: It depends on the cat and, more importantly, the approach of the photographer. As you know, you can't (and shouldn't) force a cat to do anything. We include a sheet of information with each wig we sell that gives tips on the right attitude to adopt when bewigging a cat. Full tummies usually help. And don't expect any cat to wear a wig around the house; these are strictly photo props. Most importantly, they should never be left out for cats to chew on; that could spell disaster. It's all about doing something fun and interesting with your cat. Unusual, maybe, but you know how cats are endlessly curious. This gives them something to think about. The photos in the book give them something to aspire to. LTK: What is the best way to take care of the wigs? JJ: Each wig comes in a tin case with a latch for safekeeping. It is also on a form with a hair net. It's very important to keep them out of reach of cats because, as I said before, they are not toys. They can be washed and combed out just like hair on Barbie dolls. LTK: Tell us a little more about the book project. What can readers expect to see in the book? 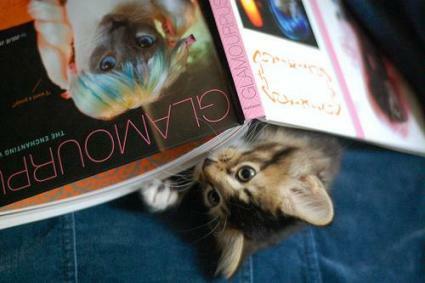 JJ: The book contains 60 unique portraits of all kinds of cats (all rescues) in a large variety of wig styles. We also added captions that express what we felt each cat may have been thinking or dreaming about while wearing a wig. I was completely amazed every time Jill sent me a new group of photos because the expressions on the cats' faces are really incredible and priceless. It's not about cutesy poses. There are all kinds of expressionsl and it was really fun to try to interpret what we were seeing into a fitting caption. LTK: Any other projects in the works? JJ: Papyrus just released a gorgeous set of boxed cards that are currently available in their stores nationwide. By July, they will be available at other stores and also online. I have a page of updates at the website to keep everyone posted. We also have hand silk-screened T-shirts which we just started selling after I held a contest for the best design. LTK: Will you be releasing new styles soon? When can we expect to see those, and any hints on what they might be? JJ: Someday... it's hard to keep wigs in stock and restock them, as I mentioned. I would like to introduce other styles into the regular line, but for now I just mention them on our Facebook page when I have something unusual. 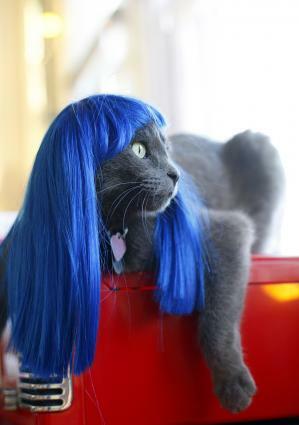 Kitty wigs is a cute, unusual idea and a way to have fun with your cat and take memorable photos of him or her. LoveToKnow would like to thank Julie Jackson for sharing this information with us. We hope that it will inspire you to take some interesting feline pictures of your own.